The usual theme of another power house week! The big deal-just over 2800 leeks went in. Not a typo-really 2800…. Scott and I planted all in just under 3 hours. Scott created a perfect row marker and a fancy “hole driller” and I followed behind and planted our pencil thick leek starts. 3 different varieties. Early, mid and late season wonders. We’re excited to start harvesting this crop around mid September. Obviously we love leeks and we’re excited to share with members (and others) starting late summer. We did things a little differently this year and started the seeds in late Feburary in deeper containers and let them grow larger than past years. MUCH!! easier to plant and a stronger start to the season. 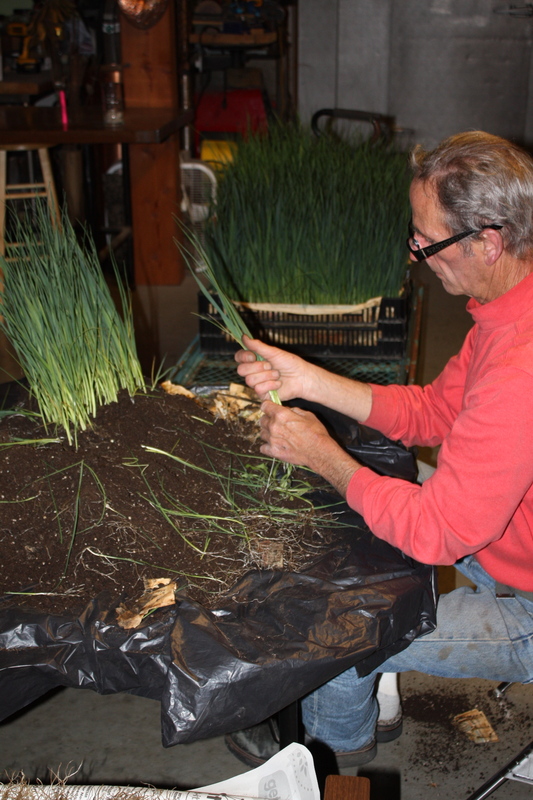 Scott prepping the leeks for planting. We started another round of brassicas and finished the melon and cucumber seed starting. 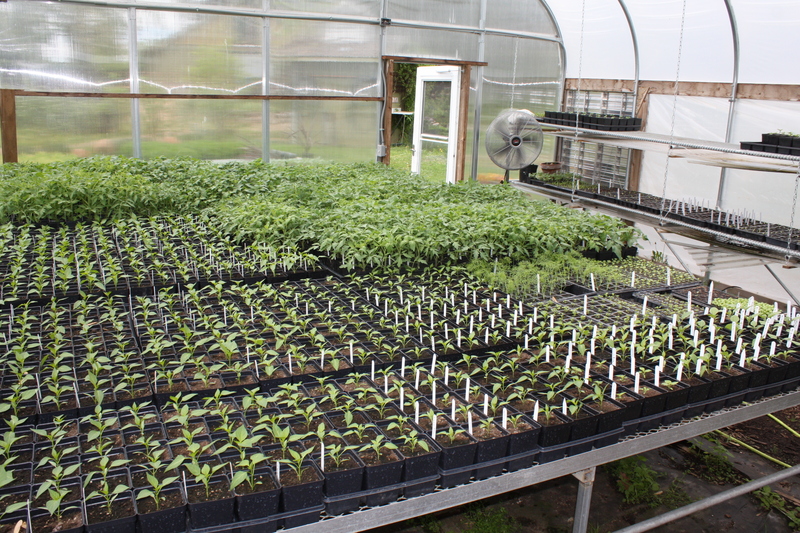 Our greenhouse is full-over FULL as the tomatoes are huge and taking up way too much space but with the projected cold temperatures the next 2 evenings we are keeping them warm, tucked in the comfort of the greenhouse and dance around all the flats of vegetables waiting to go in the ground. Our plant sale will be the last weekend of the month and then space will free up again. Challenging but a happy challenge. View from outside the greenhouse. This is the last week of Spring Share and Summer Main Season projected to start Monday June 1st. The crops look strong and we hope to have a bumper pea crop this year. 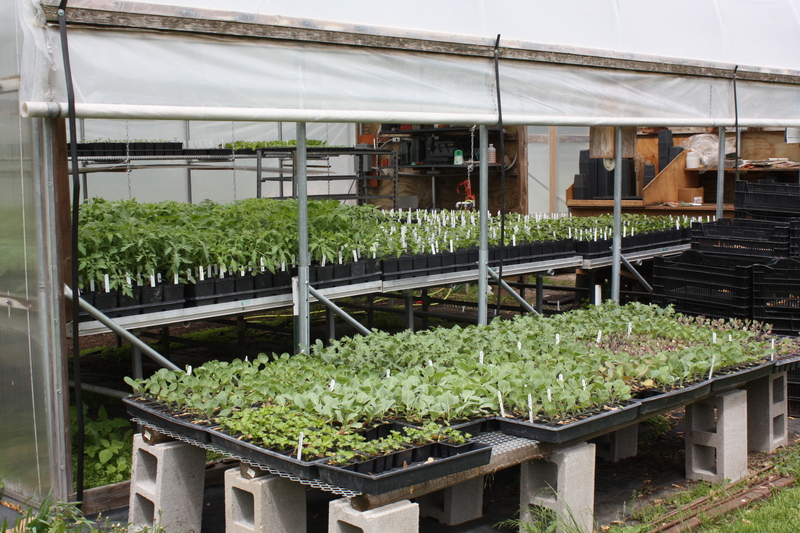 The next round of leafy greens are are plumping up in the hoop house and baby carrots forming. Our garlic crop looks great and I think the scapes are about to form. An early surprise. 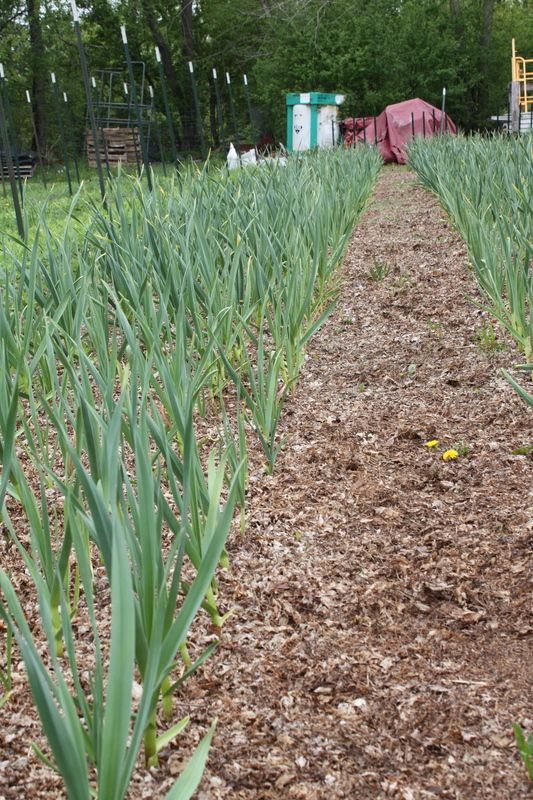 Rows and rows of garlic. Rhubarb-Our pretty Canadian Red. 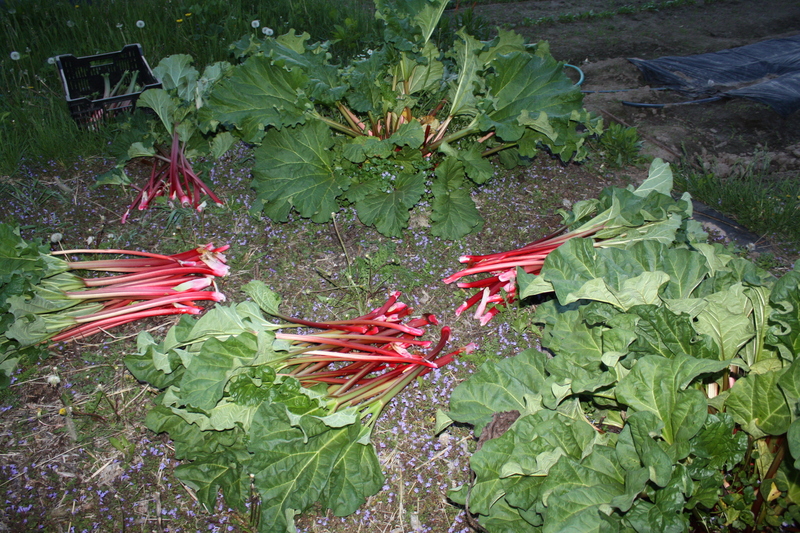 I always like to mention that I have my grandpa’s rhubarb plant from his garden so a few of you too will be enjoying grandpa’s rhubarb. Special to me. Grandma always made a custard rhubarb pie. My favorite. 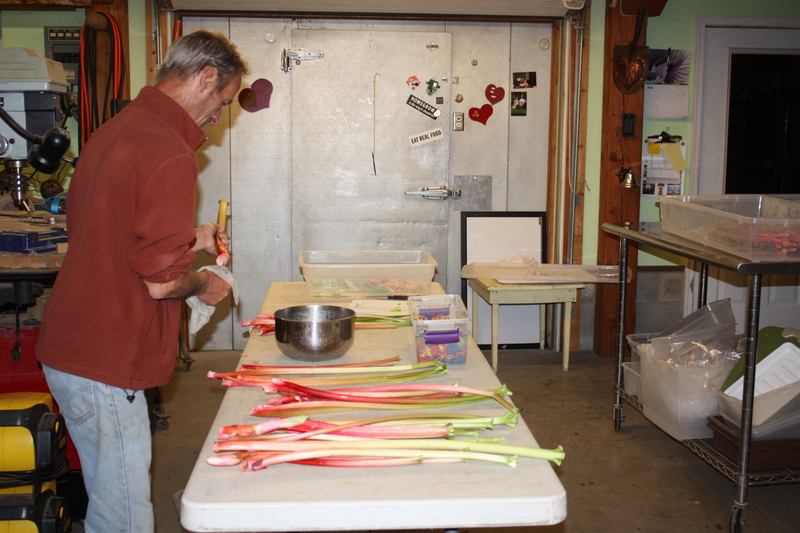 Scott washing and weighing out the Rhubarb. Spinach-Another big bag of hoop house grown spinach. Fennel-A tasty treat started early. Great shaved in a salad or roasted. 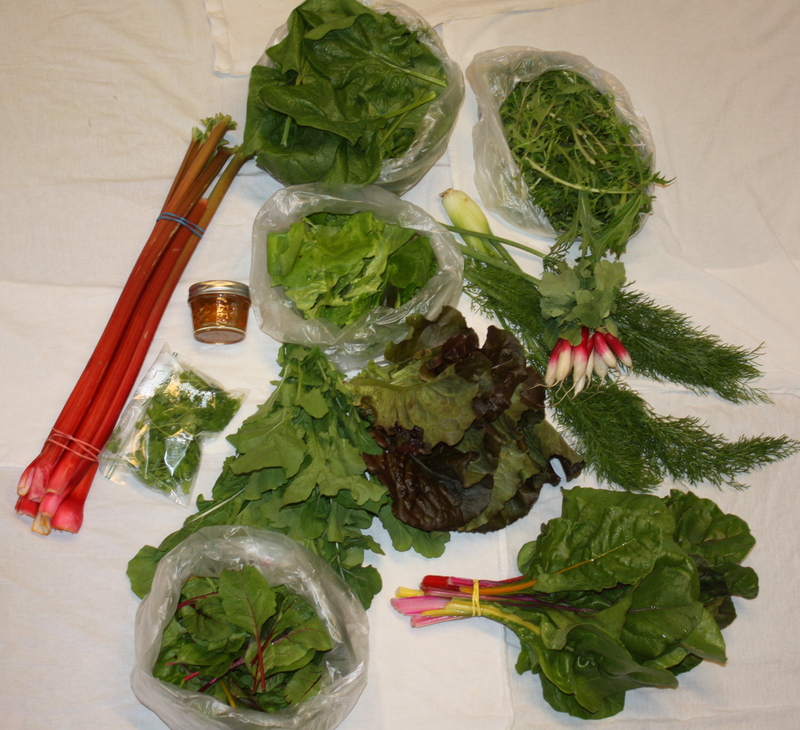 Head Lettuce-An assorted mix this week in the shares. A combo of a dark upright variety called Outrageous or fluffy butterhead named Nancy. Beta Mix-Our new favorite mix! 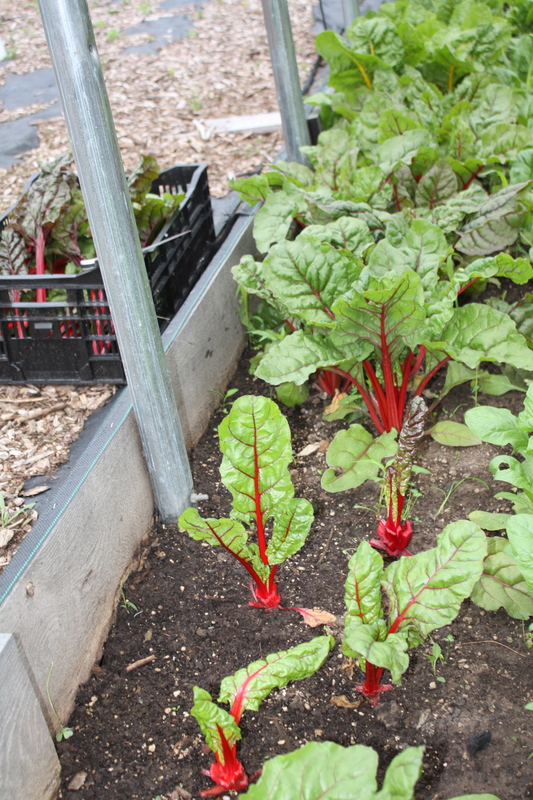 A pretty combination of baby beet and swiss chard tops. Mizuna-Spicy Asian green that can be eaten raw in salads or delicious braised. Arugula-A nice bundle of this peppery green. Radish-Our first outside harvest of the season. French Breakfast. 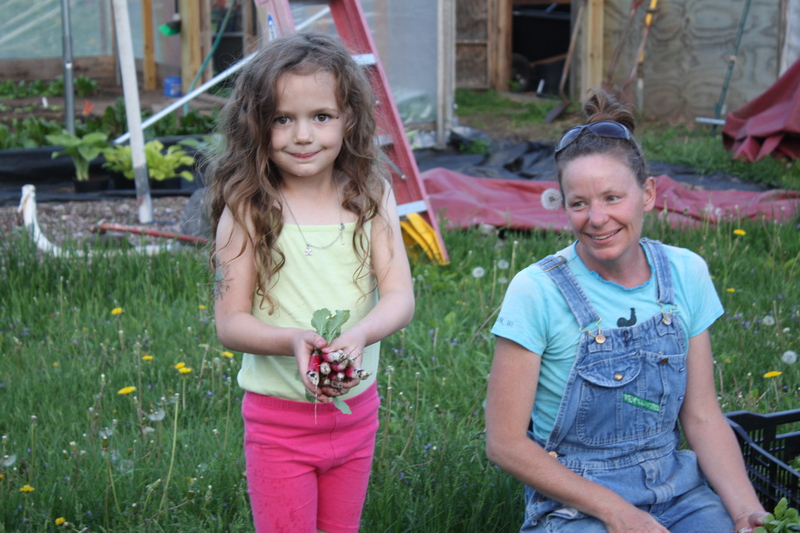 Your radish harvester this week. Swiss Chard-A tender and colorful mix from the hoop house. This is the time of year that chard is the best! Cilantro-Greenhouse grown as a nice fresh addition to dinner this week. 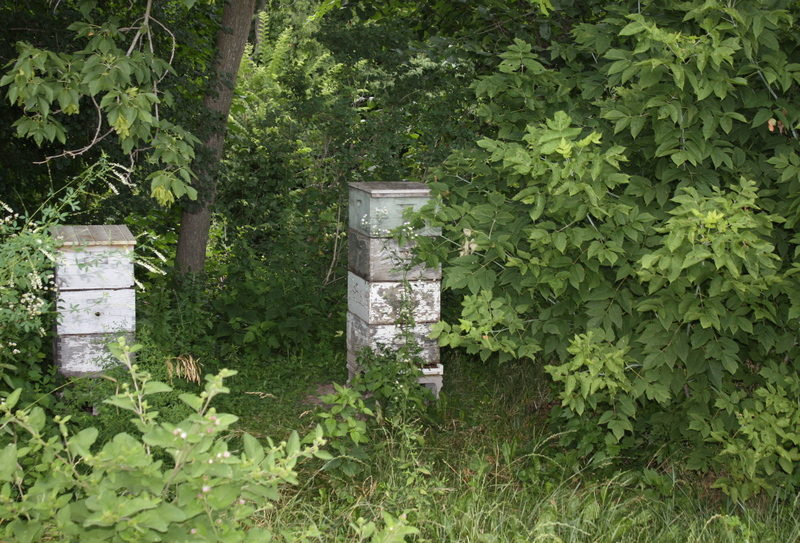 Honey!-A Sweet Treat as a happy “thank you” for sharing the Spring Season with us. Enjoy! 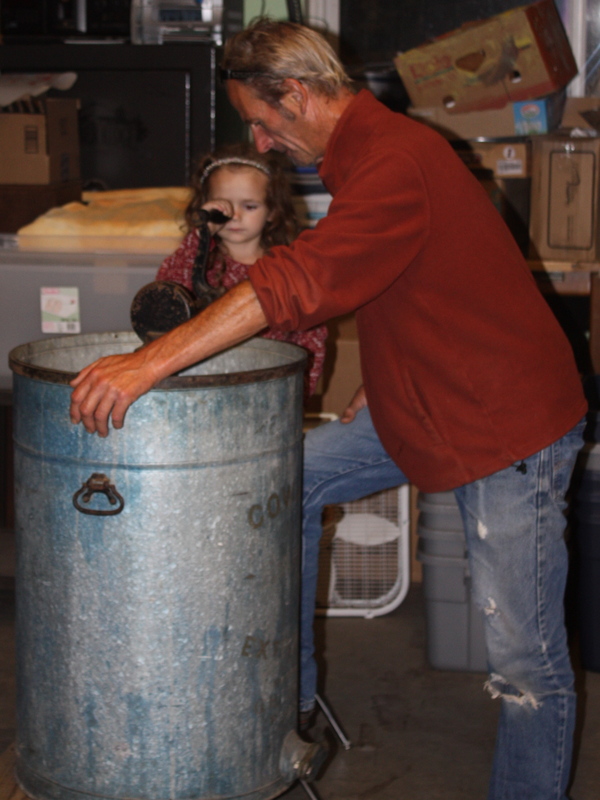 Scott and Maeve extruding the honey.